We are reeling from changes in the job market. It seems that hard labour and boring data work can be done much cheaper in the developing world. and that machines can do ever increasing more cost effective labour. We are producing more material goods than we can use. All this, according to Daniel H Pink is the results of centuries of left brain thinking. Daniel Pink's last two books got my attention and respect. 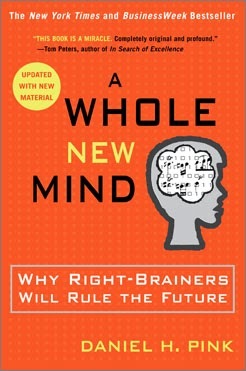 "A Whole New Mind" was published before both of them in 2006. There has been more science and anecdotal support since then while the basic idea is still sound and worth exploring. Our left brain is logical and allows us to analyze. The right brain is not only where our emotions enter, but many skills such as synthesizing to make better judgments such as recognizing faces (and detecting falsehoods) or what is likely to happen in the next instance. Daniel Goleman brought emotional intelligence to our attention. Success has never been just about having more raw intelligence than others or even hard work. Understanding people at the emotional level can be just as, if not more critical. Daniel Pink points out that while manufacturing is drifting to low labour cost markets and/or using robotics, other people are enjoying a high standard of living if they can tap into artistry, such as designers or artists. 6 essential R-directed aptitudes: Design, Story, Symphony, Empathy, Play, Meaning. He describes them with examples, and also makes suggestions how you can develop your right brain skills. Design can apply to a wide range of products and services and is at its best when it add beauty to something that is useful. Story is actually a mechanism that is often more useful than statistics to communicate information that people can understand. Symphony deals with relationships and putting parts into a whole. One tool used in this section is metaphors which are used to help us understand new things and ourselves. Empathy helps us feel what others are feeling. It is a characteristic missing from autistic people. Play is a phenomena that by definition excludes monetary incentives (of course professional athletes might disagree), yet it frees the mind to concentrate. Meaning is the goal of most of us. What is the point of it all? Pink finds that gratitude is normal for people who have found a sense of purpose to their life. Looking to the future as individuals as well as society we need to take a closer look at our right brain capabilities. Left brain activities are still valuable, but are carried out much cheaper in other markets. Dan gives many examples and suggestions to prove it need not be a painful adjustment. My first book of Daniel's was "Drive" which dealt with motivation which I can see might have been suggested from the topics of "A Whole New Mind". Motivation is often discussed in terms of providing financial incentives, but Pink finds the strongest motivation is not monetary, although the need to survive has to be dealt with first. His latest book, "To Sell is Human" was an excellent analysis that points out almost everyone is selling.